For the last 15 years, we've been recording and mixing nearly every live show around the world and making them all available for you to download via LiveMetallica.com. Thanks to nugs.net, we’ve been able to offer a variety of formats from mp3 to high-res audio and – over the past few years – a CD option as well for the fans of physical media out there. The logical next step is, of course, streaming! 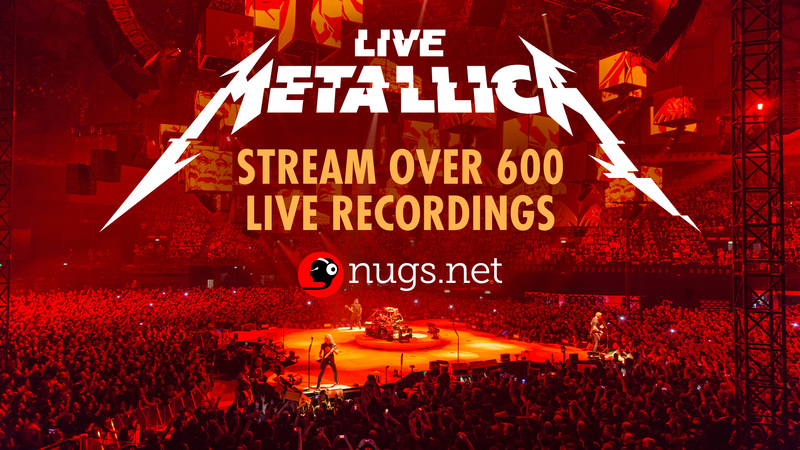 Over 600 professionally mixed Live Metallica recordings, including every night of the WorldWired Tour as well as some shows from the vault, are now streaming in both standard and HiFi on demand at nugs.net. With a subscription to the service for $12.99 (or $24.99 for high-res), you'll not only have access to our Live Metallica catalog, but also over 10,000 shows by other artists including Pearl Jam, Bruce Springsteen, and Phish. Sign up here or download the app from the iTunes App Store or Google Play Store to start your 30-day free trial and take your music with you wherever you go. Finally, don't forget that all tickets sold on the '18-'19 North American tour also include a free MP3 download … all you need to do is scan the barcode on your ticket or enter it in on LiveMetallica.com/scan to pick up that free download of the full set. We're psyched to be back out on the road, so we'll see YOU out there!